Unfortunately, it’s too late to do anything about that now. Journey to Orchard Grove, where real believers face real struggles and come face to face with the God whose plans are far more glorious than what the mortal mind could ever imagine. Wow, this book packs a punch. It was soft yet hard, characters breaking and healing, the story will string a reader through a series of emotions and thoughts. The nickname for Katrina from her husband is “mouse” when I think of a mouse I see a small sometimes helpless and fearful of life. I really didn’t see this character as such. She was hurting from a loss that can break even the strongest of women. Katrina is also struggling with finding her place as a wife and a pastor’s wife. These are different roles and she doesn’t always see it lining up with her dreams. I think Orchard Grove isn’t a town that should be ignored. It is a town with its own quirks, and personality. I was mixed feelings on some of the characters, and yet I conclude that though they could drive Katrina nuts, I think they were well meaning and added the small town flair to the story. Each person brings a new aspect to the story and delivers a reason for the reader to contemplate their own faith and where it leads them. I recommend this to readers that are looking for a complex and intriguing story line. It will give them hope, food for thought and a reason to leave the light on. Find out all the details and enter to WIN at Breath of Heaven Celebration Tour Giveaway. 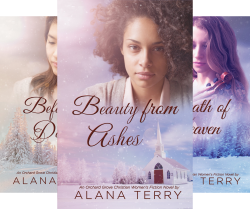 Thank you for your review on “Breath of Heaven by Alana Terry and for being part of the Celebrate Lit book tour. Love the storyline and would love to explore this author’s writing through this book. Thank you for the beautiful review of Breath of Heaven. I am honored to be a guest on your blog. Have a wonderful day.